Drug Detox (Detoxification) is a method to flush all the toxins and unwanted substances from the body while offering care for the consequential withdrawal symptoms. It is a metabolic process by which toxins and harmful materials are converted into less toxic and extractable substances. It can be understood as a process of internal cleaning that improves and optimizes the body’s functioning. Drug Detox is the initial step of any comprehensive drug rehab program. The objective of any drug detox program is physiological healing after long-standing drug obsession. A medically-supervised detox is considered as a highly effective treatment. It is proven to help improve recovery and help avoid future relapse. According to SAMHSA, alcohol, heroin, opiates, cocaine, marijuana, etc are the major substances responsible for detox admissions. Violence – Some drugs can increase aggressive behaviors in patients. Symptoms of Psychosis – Psychosis is a hazardous complication brought on by the effects of a few drugs like cocaine. If somebody uses an extreme amount of cocaine, they can turn out to be obsessed and even experience full-scale psychosis. Injury – Sometimes, it is also found that patients may have hurt themselves while under the pressure of drugs. This is also an increased risk for suicidal behaviors, which can consequence in injury if suicide is not completed. Medical Illness – Opioid painkillers are prescribed to several people suffering from chronic pain. Sometimes, the patients might get dependence and subsequent addiction to these medicines. When the patient begins to detox from the prescription drugs, they may experience severe pain along with uncomfortable withdrawal symptoms. Threat to self – Withdrawal from harmful substances such as opioids can be connected with severe depressive symptoms. This can eventually result in suicide attempts and completed suicides. Patients with suicidal thoughts or behaviors must be kept under observation. Withdrawal occurs when your body and mind get dependent on a drug from a long period of time and you get deprived of that drug. The type, duration, and intensity of withdrawal symptoms differ from user to user, but the experience is always almost hard to bear. If not medically-supervised, withdrawal for some drugs like benzodiazepines and alcohol can be life-threatening. Knowing about these withdrawal symptoms can help you prepare for the drug detox process. You will find a bit of ease in starting your journey of recovery. When you plan to stop drinking or using drugs, do not try to handle withdrawal symptoms on your own. Professional support to treat your addiction can increase chances of getting clean and staying clean. There are majorly 4 types of detox available to reach the primary stage of sober living. Each detox has its own pros and cons. So, anyone looking to recover from serious drug addiction should first go through these available options. After complete understanding, you should decide on a treatment option. Let’s have a look at the different types available. Also known as ‘Natural Detox’, the cold turkey detox is the simplest yet most dangerous and controversial type. In this detox method, the patient has to go through several stages of withdrawal while living in a private facility with little or no medical care. In this social detox method, patients are provided with psychological and emotional support by the professionals throughout the withdrawal process. This drug detox method has the least chances of breaking through the initial acute withdrawal stages and several patients end up surrendering to drug use. The cost of this detox method is minimal to none. This method is safer for patients with mild opiate and marijuana addiction. But, medical complications may occur throughout withdrawal. Honestly, a non-medical or a social detox is not recommended to patients addicted to benzodiazepines, alcohol, barbiturates, and opioids because of humanitarian and safety concerns. Also, the chances of succeeding are less when compared to other options. In order to avoid and tackle complications, patients under medical detox are treated with medicines and medical treatment. At medical detox centers, a doctor or a nurse is appointed for the patient for 24 hours monitoring. These medical detox centers help the patients to slow down the usage of drugs gradually and reduce withdrawal symptoms. This kind of detox method is for patients with repeated relapse. When trying to get clean again can at times develop a more severe withdrawal phase which lasts longer. This is also referred to as the Kindling Effect. Due to this, it becomes harder for people to get and stay clean. Medical detox centers deal with these issues with a professional touch in a safe and lenient environment. Unlike Medical Detox, you are not given any replacement medication but you are provided with some non-addictive prescription medication. Such medication helps to respond to the detox symptoms. Here, the focus is much more on the medical aspect. For example, a patient suffering from depression is given anti-depressant medicines. Thus, it makes the entire experience comfortable and easy to bear. This is typically done on an inpatient basis. In an inpatient detox, the patient stays at the detox center on a residential basis receiving 24-hour care and supervision. Usually, inpatient detox is recommended for patients who have a high risk of relapse and other side effects. The patient in a residential detox receives proper medical care and support which is very important for a successful detox. The majority of detox options are inpatient. In rare cases, outpatient detox is recommended but it can be a good option for less severe cases of addiction. In outpatient treatment, patients are required to visit a clinic, a doctor or a drug detox center for receiving medical or physiological treatment. This detox method is perfect for people with financial issues or those who are engaged at work or home. Such people can join any outpatient detox program and receive adequate treatment. Commonly called ultra rapid detox, rapid opiate detox is the fastest detoxification method done in a clinical setting. In this method, the patient is placed under a general anesthetic. Medications are then intravenously given so as to accelerate the withdrawal process. The entire procedure is monitored by the medical staff and experts. In rapid detox, the entire detoxification process gets completed within 4-6 hours. Then, the patient is kept under clinical observation for the next 24-48 hours. It is found that such programs effectively treat the addiction caused by heroin, opiates, and alcohol. It quickly eliminates the extremely painful and acute withdrawal symptoms like nausea, sweating, shaking, cravings, insomnia, cramping, anxiety, and depression. Drug detox period will last as long as the withdrawal symptoms persist. Until the patient gets stabilized both mentally and physically, the detoxification process continues. It is important to understand that every patient is not successful in complete detox in the initial attempt. Sometimes, multiple attempts might be required until sobriety takes hold. 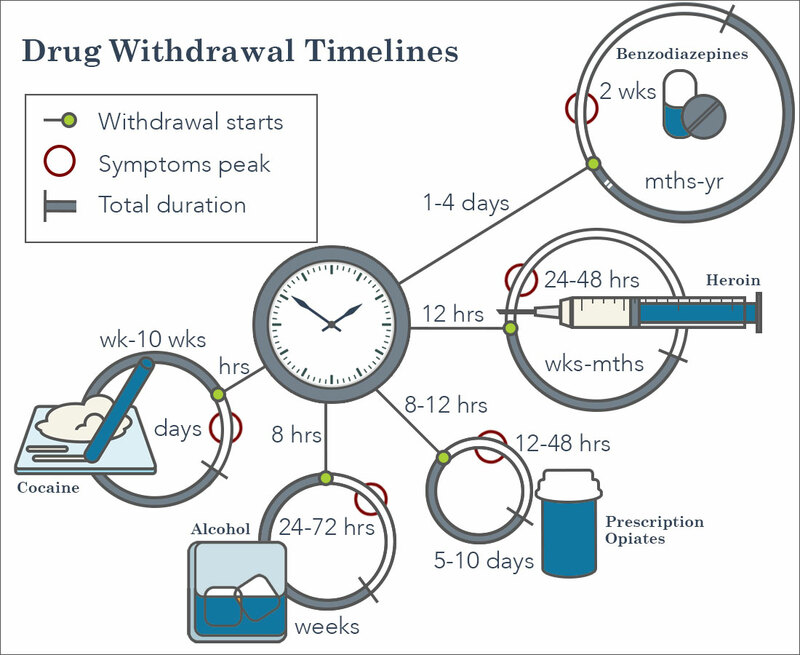 Polydrug abuse: Concurrent use of more than one drug can extend the withdrawal timeline. Level of dependence: High-level of dependence on drugs for a long time. Co-occurring medical conditions: Mental health or medical issues happening concurrently with drug abuse can extend the withdrawal process. Biological or genetic factors: a tendency to addiction either through genetic factors or family history can impact drug dependence or withdrawal. Environmental aspects: Stress levels, previous trauma, and support systems can play a role in the severity and duration of withdrawal. While detox is highly personal, in most cases, a drug detox treatment lasts one to two weeks, depending on the particular situation of the person. Drug Detox is the initial step of almost all the addiction treatment programs. People who stop using a substance and experience withdrawal symptoms cannot skip this step. Though detox alone is not a complete treatment, it is a part of the comprehensive drug rehab program. Personalized Treatment: People under addiction treatment require personal attention. They should be given the proper care they need for. Issues at home, workplace problems, legal problems, health problems, etc should be addressed properly if in any way they trigger patients to relapse or exacerbate issues with addiction. Therapy: Daily requirements in recovery are addressed by therapies. Therapies provide the patient with proper nutritional counseling, workout training, massage therapy, yoga, and meditation, etc. All these things help the patients take care of details that eventually help in a successful recovery. Inclusive Treatment Plans: Different individuals with different addiction type may take different timings to recover. Some may get quick recovery while others may take a bit longer due to continuous relapse. They should be provided the suitable treatment and should get ongoing check-ins. Family Therapy: A family is one of the best therapies wherein the patient receives care and support from the family which acts as groundwork for the healing. It fills in the patient with positivity to move forward. Aftercare: After completing a drug rehab program, it is very crucial to join an aftercare program. It offers support to individuals through sober living homes, outpatient therapy, group counseling, etc.